Asian Dragon: an Asian dragon can refer to either a traditional Chinese dragon or a Jade dragon, and this tattoo design symbolizes wisdom, power, and prosperity. In Japan, dragons are generally known as good omens. Fairy Dragon: the fairy and the dragon are complements and opposites, and combined into a single design, the fairy dragon is a symbol of the male and female duality in nature. 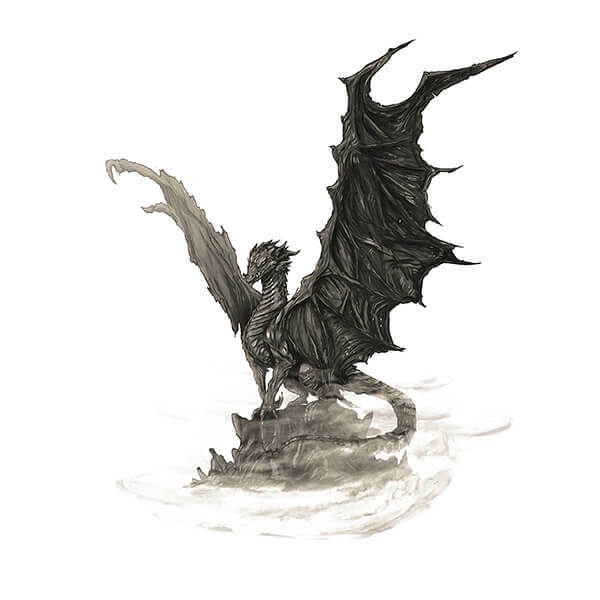 Gothic Dragon: these dark-styled dragon designs represent power, strength, and primal instinct. Koi Dragon: after the legend of the koi fish who swam upstream and turned into a dragon, the koi dragon has come to represent ambition and persistence. Moon Dragon: the moon dragon tattoo design is a unique symbol that embodies the relationship between nature and the sub-conscious. The moon, which influences ocean tides, represents ebb and flow, and the dragon symbolizes primal forces of nature. Ouroburos Dragon: a symbol from Ancient Egypt, the Ouroburos Dragon, also known as the Circle Dragon, symbolizes the cycle of life. Rising Dragon: a popular symbol for ascension and progress, the rising dragon is a popular tattoo design that also represents the overcoming of adversity. Skull Dragon: since dragons are a symbol of creation and skulls are a symbol of mortality and death, the skull dragon represents the cycle of life and the balance between creation and destruction. Sleeping Dragon: the sleeping dragon symbolizes potential or strength and power that is dormant. Tiger Dragon: in Chinese folklore, the tiger dragon symbolizes a conflicting duality, like yin and yang.The tiger stands for femininity and the celestial guardian of the West, while the dragon represents masculinity and the celestial guardian of the East. Tribal Dragon: this special tattoo design symbolizes a spiritual connection nature. Dragons are a common symbol for balance and strength, and their intricate designs are undoubtedly eye-catching. These mythical beasts have fascinated people throughout the centuries, and their influence is still felt today. If you have any other suggestions for dragon tattoo meanings, let us know about them in the comments section below!